Every ingredient we put into Nexabiotic™ is there for a reason. Each ingredient used is backed by extensive medical research published in peer-reviewed medical journals. Double- blind studies with placebos ensure the accuracy and validity of claims. When we formulated Nexabiotic™, we could have saved a couple bucks by using lower quality ingredients. We could have gone with just the minimum doses but instead went with doses that are more than effective. Pharmaceutical grade raw materials… ingredients extracted without solvents, cGMP certification…. These sound like buzzwords to the average layman but to those in the industry, it represents a commitment to quality like no other. Nexabiotic™ is manufactured in an FDA inspected Good Manufacturing Practices (GMP) facility. It is a strict standard set by the FDA to make sure you’re getting the cleanest and purest product. Unlike our competitors, we use higher quality ingredients and keep them protected with an enteric coating until they are ready for release in the colon. This ensures that our dosage of probiotics will you only get the most effective dosage with our product. Most of our competitors use low doses of probiotic that simply won’t be effective. Low doses won’t allow the probiotics to establish themselves in your colon. Add the fact that most other probiotic products don’t have protection against digestive juices in the stomach and you’ll see why Nexabiotic™ is one of the best probiotic products your money can buy. You can count on Nexabiotic™ to be effective and consistent, money-back guaranteed. What probiotics does Nexabiotic™ actually contain? 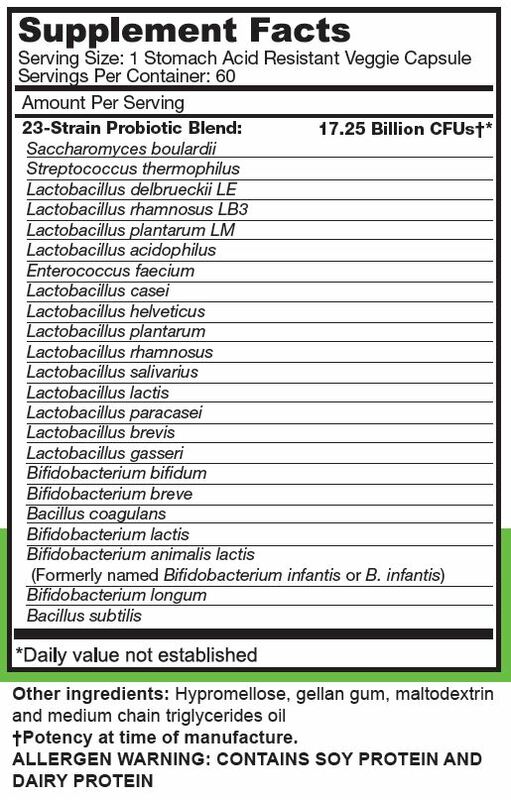 Lactobacillus acidophilus is one of the more commonly used probiotic strains because of its efficacy. Its name means “acid-loving milk-bacterium.” It feeds on milk-sugars and turns them into lactic-acid which is easily used by the body. L. acidophilus is a natural part of gastrointestinal and vaginal flora and helps to control the growth of Candida albicans which causes yeast infections if left unopposed. More specifically known as Lactobacillus delbrueckii subsp. bulgaricus, L. bulgaricus is used in to production of yogurt. It helps convert lactose to lactic acid which is helpful for those with lactose intolerance. L. casei is another lactic acid producer. Lactic acid bacteria can be found in fermented foods. The lactic acid produced by these bacteria actually help prevent spoiling. Lactic acid bacteria also produce bacteriocins which help prevent the growth of pathogenic microorganisms. L. helveticus is yet another lactic acid producer that is used in dairy production. L. paracasei is found in naturally fermented products, yogurt, and natural dairy products like raw milk. L. paracasei is not found in pasteurized milk becase the process kills all microorganisms in the milk. L. plantarum is also found in many fermented food products. It is an oxygen tolerant organism that actually uses oxygen to produce hydrogen peroxide which is then used to kill competing organisms. L. rhamnosus is a hearty bacteria and is able to tolerate acidic stomach acid and has great affinity for the intestinal walls. It has been shown to protect the urogenital tract by excreting biosurfactants that inhibit the adhesion of pathogens. Like other lactobacilli, Lactobacillus rhamnosus A also releases acids, bacteriocins, and hydrogen peroxide which inhibit the growth of pathogens. Like many lactobacilli, L. salivarius is able to inhibit pathogens while tolerating host antimicrobial defenses. 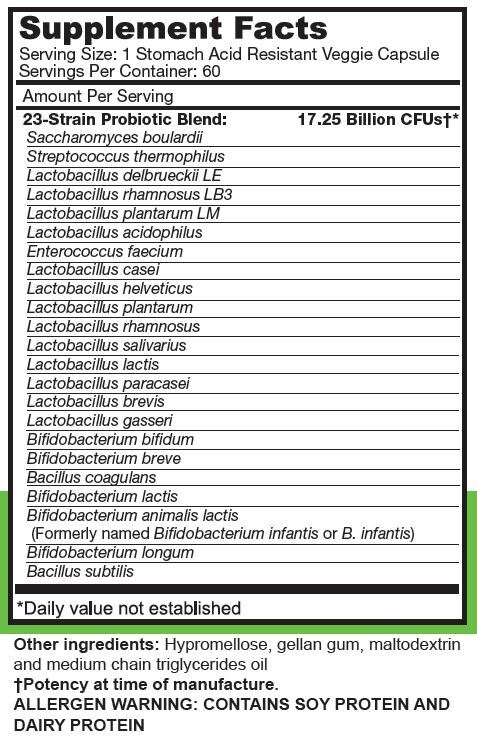 Used extensively in the dairy industry, L. lactis has the ability to break down lactose. Bifidobacteria may exert a range of beneficial health effects, including the regulation of intestinal microbial homeostasis, the inhibition of pathogens and harmful bacteria that colonize and/or infect the gut mucosa, the modulation of local and systemic immune responses, the repression of procarcinogenic enzymatic activities within the microbiota, the production of vitamins, and the bioconversion of a number of dietary compounds into bioactive molecules. Bifidobacterium lactis, or more specifically Bifidobacterium animalis subsp. lactis, helps to reduce inflammation in the gastrointestinal tract. Source 1, Source 2.